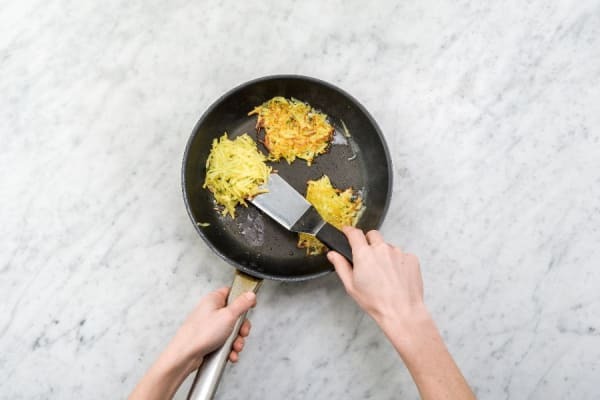 If the name rösti (ROW-shtee) sounds complicated, let us clarify: these are the hash brown cakes of your dreams. Hailing from Switzerland, they involve little more than pan-frying grated potatoes until they’re gloriously golden and crisp. 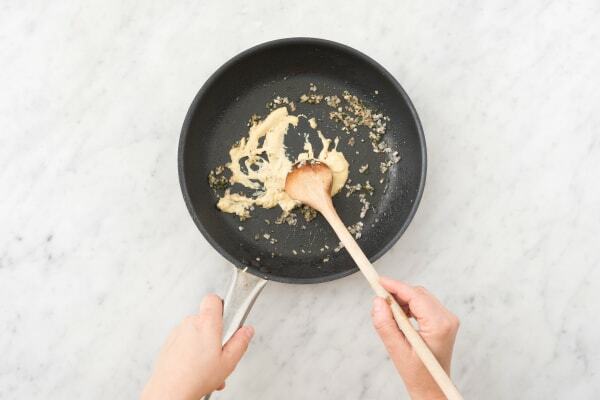 On the plate, they’re perfect for swiping up whatever sauce you’ve got—here, that’s an herby mustard pan sauce that also adorns juicy pork chops. Wash and dry all produce. Preheat oven to 400 degrees. Halve, peel, and finely dice shallot. Strip thyme leaves from stems, then roughly chop. Trim stems from green beans. Peel potato, then grate on the large holes of a box grater. Season generously with salt and pepper. Place in center of a clean kitchen towel and toss with half the thyme. 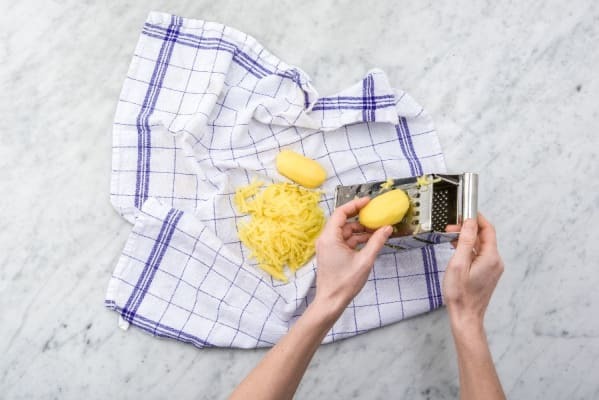 Gather towel corners and squeeze as much liquid as you can from potatoes over a sink or bowl. Heat a thin layer of oil in a large pan over medium heat. Pat together 2 TBSP mounds of potato mixture and place in pan, flattening with a spatula. Cook until golden brown, 2-3 minutes per side. Transfer to a paper towel-lined plate and season with salt and pepper. 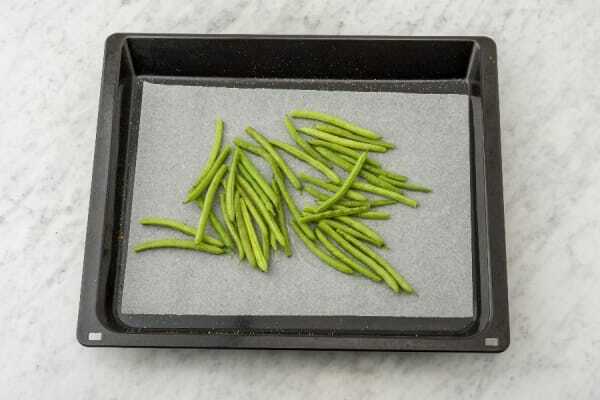 Toss green beans on a baking sheet with a drizzle of oil and a pinch of salt and pepper. Roast in oven until tender, about 12 minutes. Carefully drain oil from pan until you have 1 tsp left. Heat over mediumhigh heat. Season pork chops all over with salt and pepper. Add to pan and cook until nicely browned, 2-3 minutes per side. Transfer pork chops and potato cakes to another baking sheet. Roast in oven until pork is cooked to desired doneness and potatoes are crisp, 4-5 minutes. Meanwhile, lower heat to medium under same pan and add a drizzle of oil. Add shallots and remaining thyme and cook until beginning to soften, 2-3 minutes. Stir in mustard, stock concentrate, and ½ cup water. Bring to a simmer and let bubble until reduced to a saucy consistency, 2-3 minutes. Season with salt and pepper. 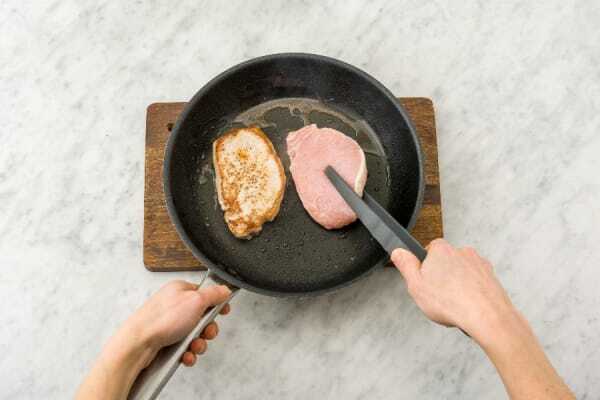 Thinly slice pork chops. 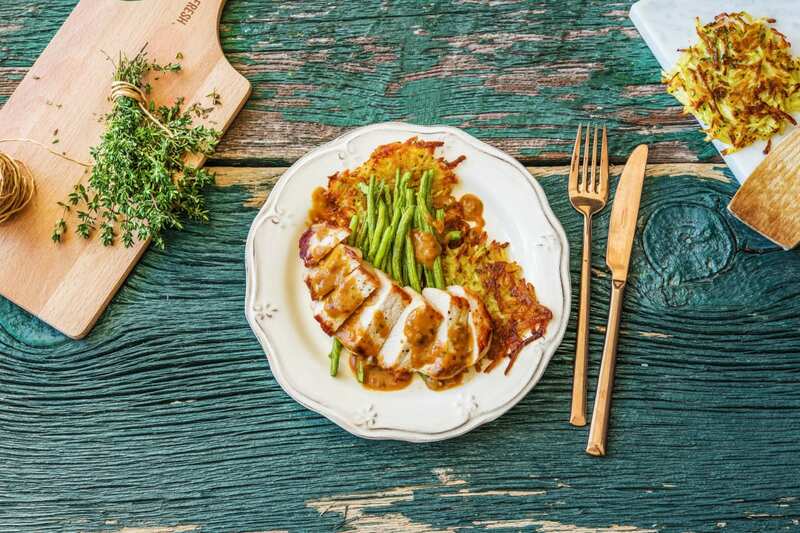 Divide pork, potato cakes, and green beans between plates. Drizzle with sauce from pan.